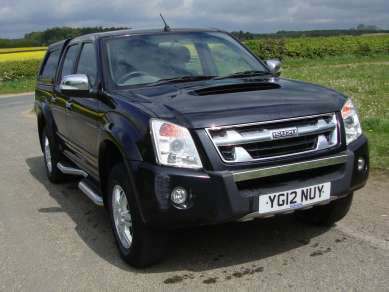 MARCH 2012 ISUZU RODEO 2.5 TD DENVER MAX 4X4 DOUBLECAB PICKUP, BLACK, 41,150 Miles, REMOTE CENTRAL LOCKING, E/W, E/M, A/C, RADIO/CD, RUNNING BOARDS, ALLOYS with Bridgestone Duelers, FRONT FOGS, TOWBAR WITH SINGLE ELECTRICS. MOT 3rd MARCH 2018. SERVICE HISTORY.